Lemon Meringue PieLemon meringue pie is a classic dessert for any occasion. 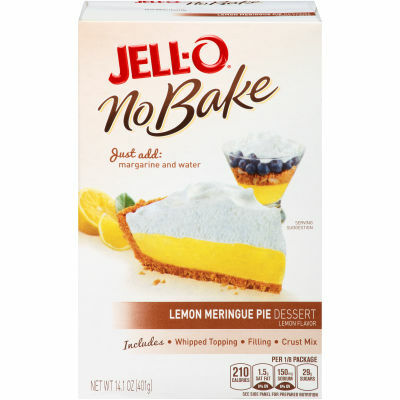 Jell-O no bake lemon meringue pie dessert mix brings together the right combination of tart & sweet flavors along with creamy texture, in a box.The fluffy meringue topping, tangy lemon filling and the crust made with delicious golden Honey Maid Grahams make a perfect dessert that is light, delicious, and easy to put together.Quick, Easy & Delicious!With Jell-O lemon meringue pie dessert mix, prepare the classic dessert in the easiest and fastest way possible, that too without even baking. The beautiful appearance, heavenly texture and lemony flavor is to die for. Serving size 1/8 package (50g).